4.4 out of 5 based on 62 bloggers and 12 commenters. 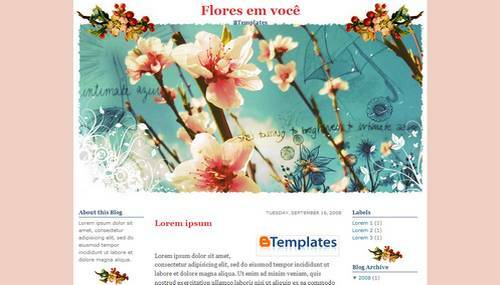 Flores em você is a free blogger template with 3 columns, left and right sidebars, minimalist, girly looking, floral motifs and vintage style. How do I add this template to my blog? The file doesn’t download. I don’t know why can’t you donwload this template :(. More than 900 users already downloaded the file. this template is lovely! I downloaded it for my jennydolls blog…thank you very much for kindly sharing. Thank You :) The template is great!!! I just tried uploading this to blogger and got error bX-xuyvo5. Great template. I’m using it and I love it! Although I have a problem: after I uploaded it, the navbar just disappeared. Could somebody tell me why, and how can I put the navbar on my blog again? Everytime I try to upload it into Blogger, I get an error message. I’ve tried several times. I even tried copy/pasting the code into ‘edit html’ section, but I get an error message saying that the xml is not closed properly. What am I doing wrong?? Can someone please help?? I love your designs, they’re so beautiful.